If knitting were music, the basic stitch counts could tell you the rhythm (or time), and the knits and purls could be the notes. 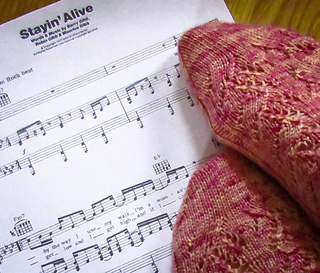 If knitting were music, a simple two by two rib could be translated to the Key of C (no sharps or flats, just natural notes), in 2/2 time (or cut time). Changing just a few stitches (the notes) to cables or lace (sharps or flats) the entire musical world is at your knitting fingertips. With a basic ribbed back, but an interesting pattern on the front, these socks give you the best of the “ribbed socks fit so well” and “patterned socks seem to knit up so quickly” worlds. 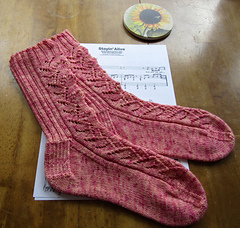 This cuff down sock includes a heel flap and gusset and nupps worked in the round. Although instructions are given for 7 st nupps, 5 st nupps can be substituted. Don’t like nupps? The foot chart, which doesn’t include nupps, can be worked for the entire length of the sock. 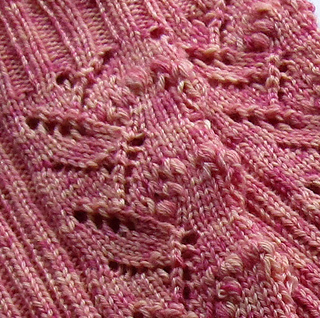 Skills required : Working in the round, knit, purl, k2tog, k3tog, nupps, ssk, sssk, yo and kitchener stitch. You can also substitute your favorite toe and heel, if you have one! Thank you to Nancy Bellamy of LivetoKnit for Tech-Editing Services and all my test knitters!